Abstract – Instagram’s new application, IGTV brings about a change in how we consume media. Will it act as a replacement for platforms such as YouTube, Vimeo or Snapchat sending them out of business? IGTV also raises questions about how the content shared has an impact on the audience’s perception and also the choices they have based on the medium of communication. Remember the days where you would wait for the school to end, then rush home to watch the afternoon cartoons? I’d say not much has changed. As soon as a class or work finishes, we instantly check our smartphones. Be it to text people back, check our social media notification or simply go through our news feeds. It has already become very similar if not equivalent to that feeling of being back at home in front of the television, however, the wait is now gone. Also, the content to has had a change primarily due to the way we access it. Traditional forms of media have been going through a lot of change. People are now able to watch TV shows or films on whatever device is available to them. It started with sites such as YouTube, Vimeo or even Netflix and has now evolved to an extent where an app can replicate the whole experience of just switching on the Television set and browsing through the channels. Instagram’s new application or feature, ‘IGTV’ is just another example of this change. It allows vertical videos, thus enabling audiences to watch with ease on their smartphones, and makes it easier for bloggers, influencers and also companies to upload content. Thus like most persuasive technologies IGTV too takes on a variety of roles in persuading and influencing its consumers in the form of audiences who are not influenced by Instagram influencers, vloggers, artists and activists but also can be persuaded by businesses that can sell their products by providing solutions in the form of their products through these videos without having to use another source (example YouTube) in order to showcase their products or send their message. Although unlike traditional TV or even newspapers whose primary purpose according were to sell advertisements, IGTV does not have advertisements yet however, businesses can and are using them to advertise their products without being in the form of a traditional advertisement which under normal circumstances we may ignore or reject. 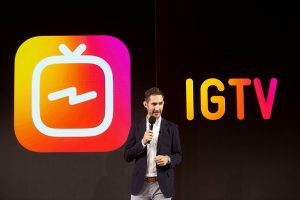 “There’s no ads in IGTV today,” says Systrom, but he says it’s “obviously a very reasonable place [for ads] to end up.” He explained that since creators are investing a lot of time into IGTV videos, he wants to make them sustainable by offering them a way to monetize in the future. 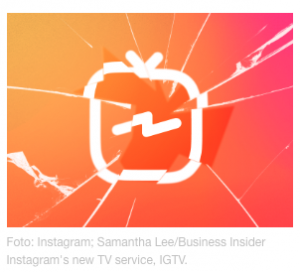 IGTV appears like the cable TV when opened. The way different channels/suggestions appear on IGTV. Just like turning on the TV, IGTV starts playing as soon as we open the app. We do not have to search to start watching content from people we already follow on Instagram, and others we might like based on our interests. We can ‘swipe up’ to discover more content, and switch between content designed ‘For You’, the people we are following, ‘Popular’, and to continue watching content we had been previously. We can also like, comment and send videos to friends using direct messages. 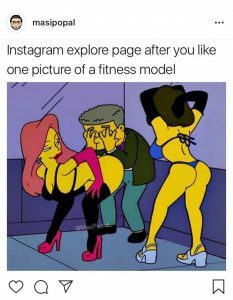 The meme depicts the way recommendation algorithms work on Instagram. According to Forbes, with societies always being connected today, IGTV may provide a convenient platform for television consumption, which may change the way we watch TV forever. However, I do not completely agree with this. It brings me back to think, no longer is it the same innocent process of coming back home from school, turning on the TV and escaping into another world. In fact with the ease with which content is available, for people to share as well as to consume with the evolving media, changes not just the experience for the audience but also the content itself and the influence it can have on the audience depending on the choices the medium might give them. “We are too prone to make technological instruments the scapegoats for the sins of those who wield them. The products of modern science are not in themselves good or bad; it is the way they are used that determines their value.” That is the voice of the current somnambulism. (McLuhan Understanding Media: Extensions Man) Technology in any form could do anything but add itself on to what we already are. Brucker, Nick. 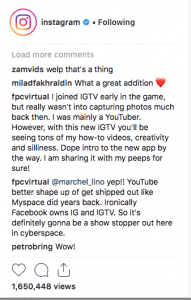 “Why Igtv Is Positioned to Change the Way We Consume Tv.” 2018. Web2018. Constine, Josh. “Instagram Launches Igtv App for Creators, 1-Hour Video Uploads.” 2018. Web2018. Fogg, B. J. “Persuasive Technology: Using Computers to Change What We Think and Do.” Ubiquity 2002.December (2002): 2. Print. Gillespie, T., P.J. Boczkowski, and K.A. Foot. Media Technologies: Essays on Communication, Materiality, and Society. MIT Press, 2014. Print. Gillespie, Tarleton. “The Relevance of Algorithms.” 2014. Web2018. Hamilton, Isobel Asher. “Instagram’s New Tv Service Recommended Videos or Potential Child Abuse.” 2018. Web. John, Nicholas A. “The Social Logics of Sharing.” The Communication Review 16.3 (2013): 113-31. Print. Joler, Vladan, and Andrej Petrovski. “Immaterial Labour and Data Harvesting.” In Facebook Research 2016. Web2018. Lievrouw, L. Alternative and Activist New Media. Wiley, 2013. Print. McLuhan, M. “The Medium Is the Message.” Understanding Media: The Extensions of Man. Ed. McLUHAN, MARSHALL1964. 68. Print. —. Understanding Media: Extensions Man. 1966. Print.